A thoroughly enjoyable, action-packed read. The only slight criticism I have is Ben Hope's lack of research into his employer's background. He appeared to take everything at face value, whereas a little bit of research would've been more logical. I suspect the 'logical research' was omitted in order to spring a twist upon the reader. Despite this, I was hooked and will definitely be reading more of Scott Mariani's Ben Hope adventures. FORMER SAS OPERATIVE BEN HOPE IS RUNNING FOR HIS LIFE. Enlisted by the beautiful Leigh Llewellyn - world famous opera star and Ben's first love - to investigate her brother's mysterious death, Ben finds himself caught up in a centuries-old puzzle. The official line states that Oliver died whilst investigating Mozart's death, but the facts don't add up. 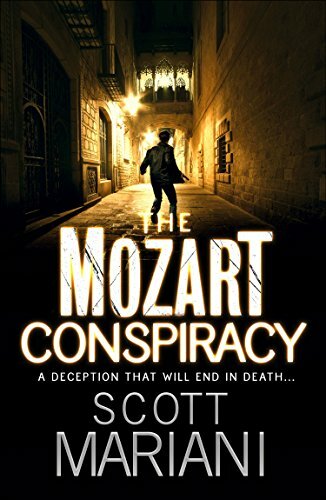 Oliver's research reveals that Mozart, a notable freemason, may have been killed by a shadowy and powerful splinter group of the cult. The only clues lie in an ancient letter, believed to have been written by Mozart himself. When Leigh and Ben receive video evidence of a ritual sacrifice being performed by hooded men, they realise that the sect is still in existence today…and will stop at nothing to remain a secret. 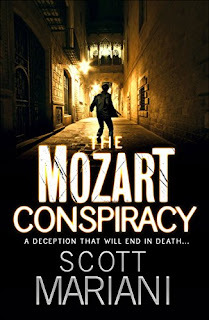 From the dreaming spires of Oxford to Venice's labyrinthine canals, the majestic architecture of Vienna and Slovenia's snowy mountains, Ben and Leigh must forget the past and race across Europe to uncover the truth behind THE MOZART CONSPIRACY.